The business world is changing. And not just in the realm of technology and evolving demographics. Modern companies are expected to foster a culture of collaboration and integrity, with leaders that inspire rather than control. Is your company one of them? Cultivating a compassionate and mission-driven team does not happen by chance, but you can learn the fundamentals that are at the core of doing just that. Could you, your business or organization use an eye-opening presentation that will create a transformative impact on those attending? Are you looking for a speaker that they will never forget? Denise Clelan’s deep understanding of human behavior, combined with her passion for helping people to connect with their true purpose, produces an experience that will resonate like no other. Denise understands the realities of business challenges and team dynamics, and she expertly navigates the challenges of modern work-life balance for business owners. 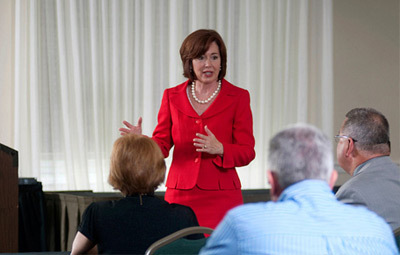 Many speakers deliver useful information, even thought-provoking insight that can immediately benefit people. The difference with Denise is her ability to dramatically alter one’s perception of who an individual is and who they are meant to be on a deep level, identify patterns that were previously unknown, and draw out epiphanies in a short time. Please contact Clelan Coaching to arrange a speaking engagement with Denise.